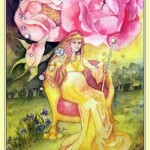 The Great Mother presents herself in this card as The Empress. Her whole Being is an expression of womanhood. She is full of life and love. She is protective of her creation, nurturing and patient. She is also very lovely, sensual and seductive. Wherever she is present, there is beauty, and abundance. The physical world with all its natural beauty is her expression but she herself is a goddess and exists on a higher dimension. In her realm there are colors, forms, geometry, symmetry and creative expression so exquisite that it is beyond the comprehension of our five senses. It is a fantastic realm that can be perceived through nature. In her realm the fairies and nature spirits are alive and active. There is excitement and joy surrounding the creation and maintenance of life and beauty. The brilliance of sunscapes, the majesty of mountains, the serenity of forests, the gorgeousness of wild flower meadows; these are her expressions. Nature is her doorway and in places where it is untouched, her energy is pure and powerful. The Empress card is very pertinent at this time as it is the feminine energy we are struggling to come to terms with and bring back into a balance. We have learnt that we cannot live against nature. Nature functions within a system of wholeness. Within nature every part has a purpose. There is balance and harmony. We’ve come to realize of how important nature is for us and that we must live within nature’s order and not above it. The Empress is not only available in nature but also through women. Women are the natural channels for her beauty, creativity and abundance. The imbalance present in nature is a reflection of the imbalance between the masculine and feminine energies. Our world has become overly based on competition and dominance. When women understand the power that is lies in beauty, love, creation and nurturing, and when men appreciate and honor these qualities, then nature will be able to regain her balance. Women have experienced the victim role and many are finding strength by moving towards the masculine pole, but true empowerment will be through drawing in the loving qualities of the Empress. 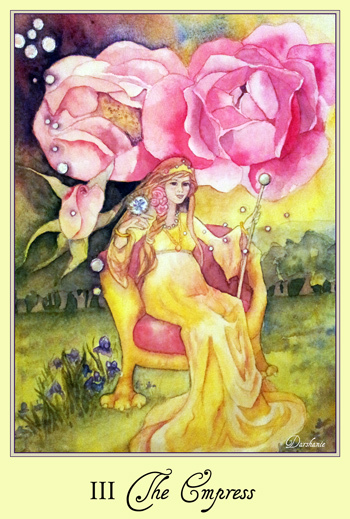 The Empress is deeply aware of the cosmic aspects of timing as it relates to creating and sustaining life. She is connected to the cyclical timing of the sun, the moon, the seasons and the eons. She understands the natural rhythms and patterns of nature which form an organic structure for her creativity. There is an intuitive intelligence that orchestrates place, function and timing. In this card the Empress is seated on a sumptuous golden throne. Her dress is also gold and she wears a golden crown with brilliant diamonds. This shows her opulence and command over success and abundance. The lion feet of her throne and her pregnant state represent her creative powers. She holds a staff with a green orb which is vitality itself and her ability to gift life. Resting on her finger and all around her are orbs of light, the fairy beings which are her subjects. Roses are an expression of her beauty, softness, love and sensuality. The purple irises represent her intuition and connection to higher realms. When you get this card, tune into your heart and feel your creative spark. How are you using your creative force? Look at the beauty in your life and nurture it with affection and care. Use your creativity to bring harmony into your environment. Honor the rhythms and timing of nature. Life wants to flow through you and find an expression. See where in your life this can be. This card could signify pregnancy, fortune, prosperity, sensuality and harmony. This entry was posted in Major Arcana, Tarot on November 3, 2013 by darshanie.